The children are introduced to theme work each week. We have a variety of themes which we do, they learn as they play and during sing time, story time etc. Our activities include colouring- in, painting, play dough, building puzzles and general playing. The children do spend a lot of their time playing outside. Paediatricians have explained to me that children need to play outside as much as possible, they need to run around without shoes on to build up and strengthen their little bones in their feet, they need to climb jungle gyms to strengthen their arm and finger muscles which will help them when they are in ‘big’ school when they are introduced to school work. Our baby class is always kept very small to ensure each baby is very well looked after and their individual needs are taken care of immediately. Our baby class is separate from the rest of the school. The babies are never left on their own. The children in this class spend a good part of their day playing outside, however inside their classroom they have a choice of various activities which include a chalkboard, a DIY board, soft balls, bean bags and building blocks. Their teachers will read to them, teach them songs and tell them stories. The children are taught how to respect each other and how to play together in a kind and friendly manner and how to share. 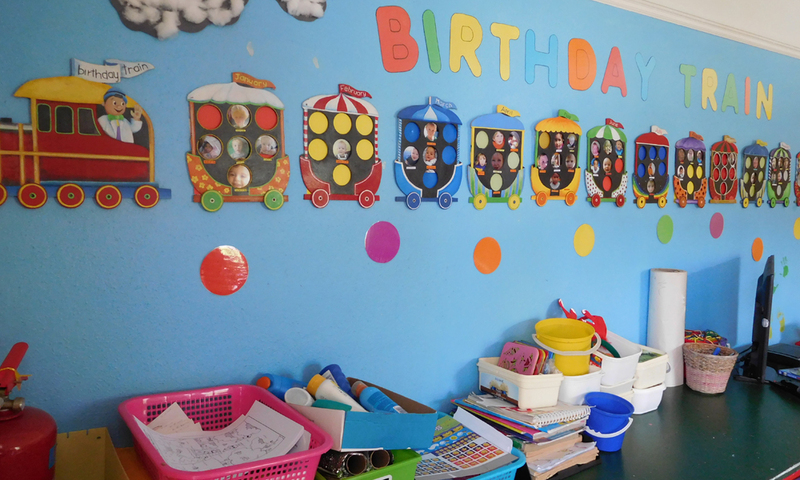 Our 2 – 3 yrs are potty trained in Bhongo’s class. Their daily activity includes story time, song and dance, colouring and working through their themes for the week. The children in this class have a file which holds their work for parents to view at their convenience. The children are learning to speak and so our teacher spends a lot of time ‘chatting’ to the children and engaging them in conversation. This class spends much of their day outside, alternating with the other classes. Fantasy play, building blocks, reading are a few of the activities available. The children in this class are taught how to respect each other and to wait their turn when talking. They are also expected to tidy up after themselves. Teacher Nicol’s class consists of a lot of talking to the children, also engaging them in conversation etc. The children learn through play and story-telling. Each week a new theme is introduced and the children are given pictures to colour, glitter etc. In this class the children are encouraged to take responsibility of their own possessions and to look after them. They are getting ready for ‘big’ school so are treated like the ‘big’ children. They are sometimes asked to be messengers between the teachers. The children find this very exciting! The children in this class are taught self-respect, to encourage others and to realise when he or she has offended a friend and when to say sorry. They are expected to tidy up after themselves, pack away their lunch boxes etc.